Mother’s Day is just around the corner! 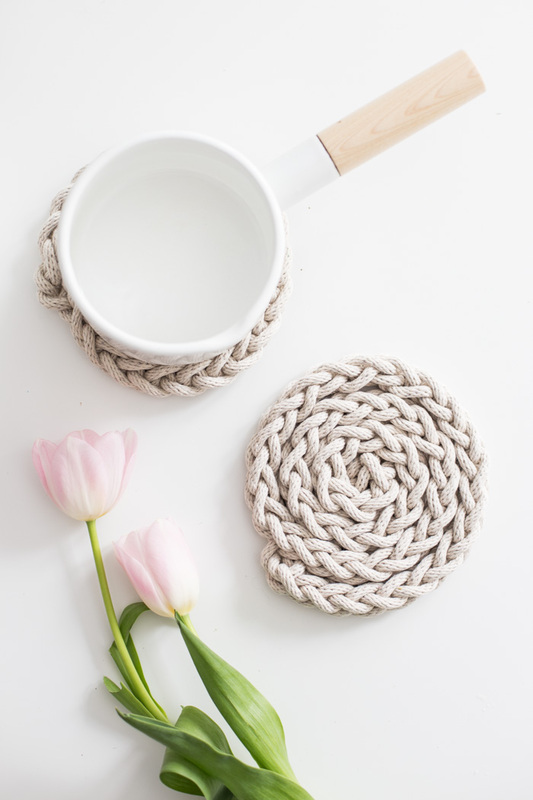 I thought this quick DIY Finger Knit Rope Trivet would hit the spot for an easy, yet beautiful project for the kids to make. Or, who are we kidding? Just make one for yourself! I have DIY kits in the shop if you want to get started right away! 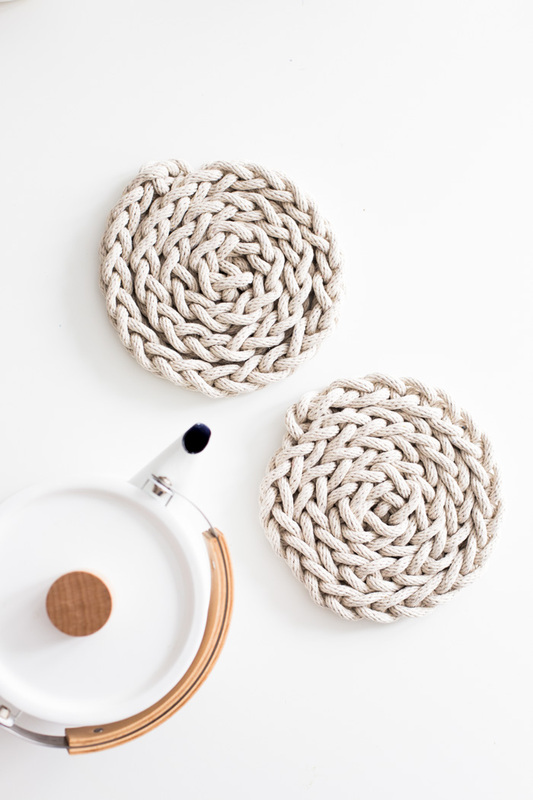 I love the trivet’s simplicity and natural feel that the rope lends this project. The best part is that you can make the trivet in a jiffy, under a half an hour, with only rope and tape (to keep the rope from fraying)! Trivets are so handy to have around and I love when a whole table of them coordinate at a party. How beautiful would a series of these in different sizes be strewn across a buffet. To make them, bigger, just finger knit longer or shorter strands than suggested in the DIY tutorial below. The idea for the finger knit rope trivet has been floating around in my brain since I brainstormed finger knitting projects for my book almost three years ago now! I’ve always thought a finger knit rope trivet would be a perfect addition to the kitchen, but the project got dropped from the Table of Contents. Lucky for you, it didn’t drop from my brain ;)! I’m so glad to have a set of these in my kitchen to use now. On a side note, and because I know you will ask, I love that this post allowed me to share my beautiful Kaico enamel cookware! The little milk pan and the tea kettle are the best! I think they are gorgeous. I adore their simple design, the white (of course), and the light wood. I’m trying to embrace the idea that I am inviting only things I LOVE into my home. These definitely fit the bill. The trivet is made with two-finger knitting. 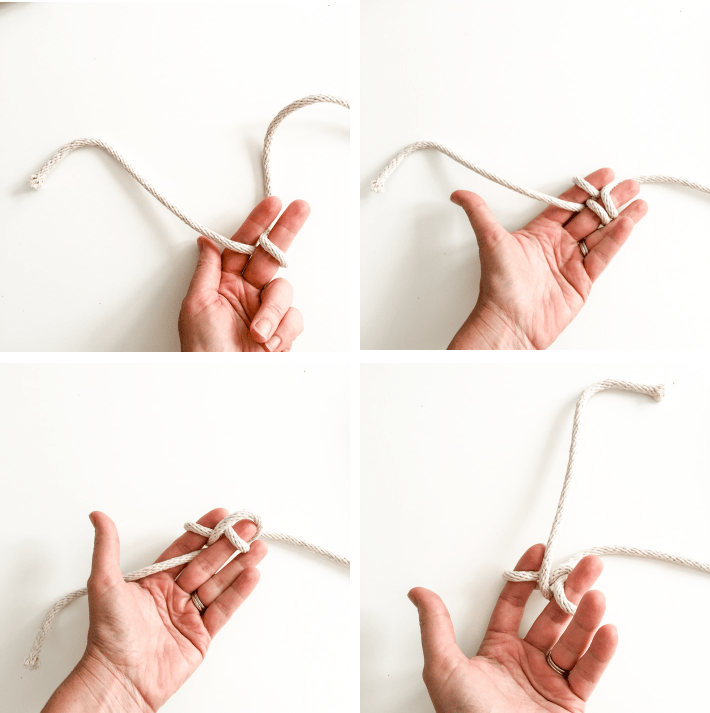 :: Leaving 8″ of tail, wrap the rope over your fore finger, and under and around your middle finger. 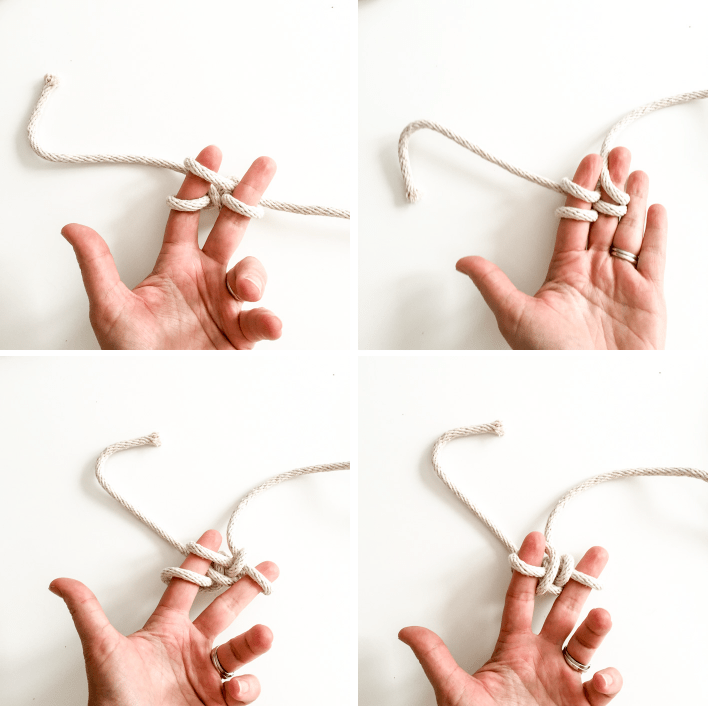 :: Continue to wrap the rope under and around your fore finger, then under and around your middle finger. There should be two strands on each finger (including the tail). :: Lift the bottom strand on your middle finger over the upper strand and off your middle finger. :: Bring the tail in between you fore finger and middle finger (essentially over the upper strand on this finger and over your forefinger). :: Next, wrap the rope around your fore finger again. :: Then, wrap the rope under and around your middle finger again. :: Lift the lower strand on your middle finger over the upper strand and off your middle finger. :: Lift the lower strand on your fore finger over the upper strand and off your fore finger. :: Continue with the above four steps, finger knitting approximately 55 rows. Finish the piece by cutting the end (leaving a foot and a half to the end) and bringing it under the loop on your fore finger and then under the loop on your middle finger. Pull the loops off your fingers and pull the end tight. :: To assemble the trivet, bring the 8″ tail at the beginning of the finger knitting strand through one of the strands of the fifth row of the finger knitting. Pull so the finger knit strand begins to coil against itself. :: Coil the piece further (keeping the strand flat and not twisted) and feed the tail through the row of finger knitting directly opposite where the tail comes out of the first coil (through row 15 or 16). :: Pull tight so the trivet continues to coil in a circle. The strand should be coiled tightly, though not so tightly that the coil starts to bunch. :: Keeping the finger knitting strand snug up against itself all the way around the coil, thread the tail through the finger knitting again directly across from where the tail exited the last coil. :: Coil one more time and thread the tail through the last coil and the end of the finger knitting. You want the end of the finger knitting strand to just make it to the tail so you can easily knot the ends together. This avoids a floppy piece at the end. If your finger knitting is too long for this, remove a couple of rows. If your finger knitting is too short, try coiling a little tighter or add a row or two. Pictured is the underside of the finger knitting. You can see where the tail has been threaded through each successive coil. 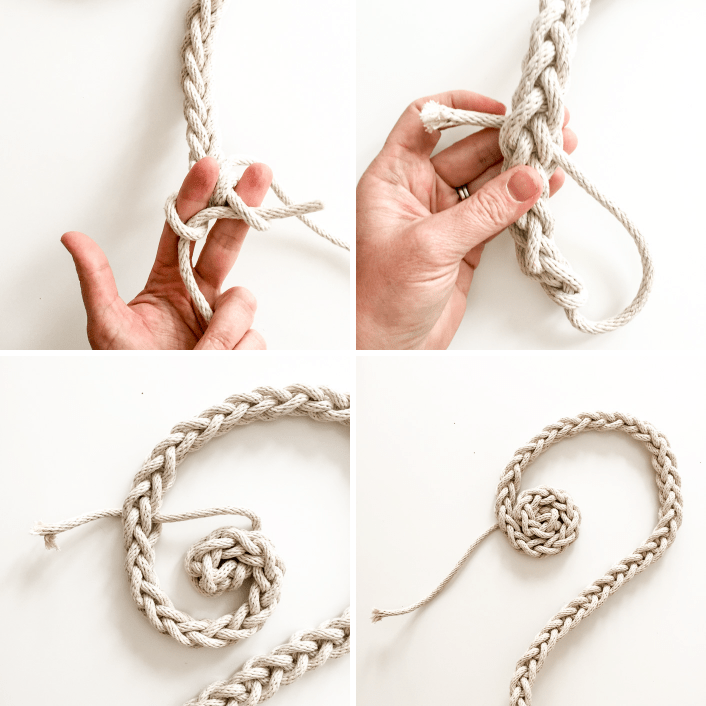 Feed the rope from the end of the finger knitting strand through the trivet and tie a knot with the tail you threaded through the coil. :: To finish the ends so they don’t fray, wrap clear packing tape around the rope about an inch from the trivet. :: Cut the rope through the tape wrap. Weave the ends into the trivet. I hope you love your new trivets! I love the simplicity of these! I think I’m going to make some and add a little leather strap for hanging up! That’s brilliant Courtney! Would love leather accents on these! that I hope to put to good use very soon. This is great! I may just wear mine as a necklace it’s so pretty. Thinking about dying it pink! Thank you for the tutorial. I love that idea Tricia! I think your trivets are beautiful. I ordered some cotton cord and selected 8mm which is the equivalent to 5/16ths of an inch. But it is so much thicker than in your images and unfortunately I can’t manage your instructions. I think I shall have to try again with finer cord. Oh no. I’m so sorry it was too thick for you. The rope was definitely slightly tough to work with. I’m pretty sure that was the correct size. Try 1/4″ and see if that works better for you. It could be that your fingers are smaller than mine as well. I liked ur site very much. Thnks. Thank you! I’m so glad you like it!! I absolutely love this idea! I have made 1 coaster so far and I am going to make a lot more and have a go at increasing the measures to make some placemats! Thank you so much for sharing for free and making the instructions very easy to follow! Great idea Sally!! Have fun! In Spanish too, Please !!! I wish I knew spanish so I could translate it for you. Have you tried Google Translate? I did the same using t-shirt yarn. Do the trivets stay together well or will they unroll easily when moved around? They are so cute!!! Thanks so much Karen! They do pull apart a little. They don’t totally fall apart but sometimes the inner circle pops up a bit, etc. You could avoid this by running another securing line through the trivet. Would a round of felt added to the back as a support help it to not pop out? I think that’s a great idea! What a wonderful addition. Thanks for suggesting it. I love the trivets!! You are so talented!!! Can you add me to your email updates for you blogs and tutorials!! What a great idea!!! They look so simple and stylish. I absolutely love them! Thanks so much Gerry! I’m so glad you like them!! This is brilliant! I love creative use of knitting! To be honest I immediately thought these were crochet projects, but I’m still tempted to try. Or maybe I’ll try a crochet version since I’m more comfortable with crochet. Thanks for the DIY! Thanks so much Sabine! They would be beautiful in crochet as well! Finger knitting is actually super easy to do. I taught my 2 daughters (ages 10 and 7) over the weekend to finger knit. My oldest made a finger knit cowl yesterday and is super excited about it. My 7 year old is just beginning but is finding it super easy and fun. She was nervous at first but got the hang of it pretty quickly. With all that being said, the word knitting sounds daunting for those that are not used to it just like crocheting, but it is actually super easy. The video tutorials on how to do it are very helpful especially if you are a visual learner. 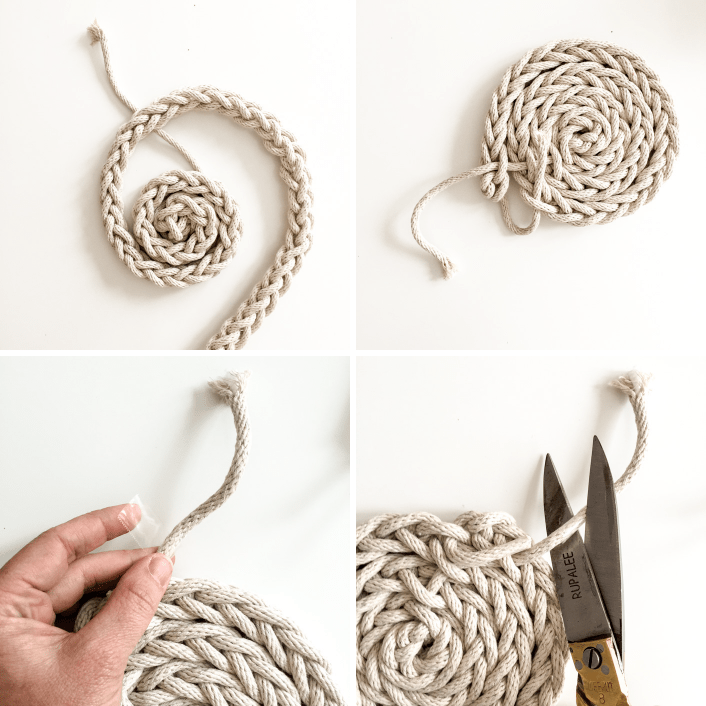 Can you do this project with a chunky wool yarn instead of the rope? I think that chunky cotton would be better than wool. AT least it would be more washable. You can use wool, just keep in mind that washing it might result in felting. Excellent!!! It’s really the great idea for the presents. I’ll try to do it for my friends. Thank you so much! Hi! Yes, do!! have fun!! I just made one now and it looks awesome! Thanks for the tutorial! Oh great!! I’m so glad Kelly. Your welcome! I’ve been intimidated by all sorts of knitting for a long time, despite success with other crafts – this makes me want to give it another try! Thanks! You should Kristen! It’s really fun and easy. First try finger knitting just with yarn. It’s easy to pick up. The rope makes it a little more difficult, just because it’s not flexible. But please give it a whirl and let me know how it goes! Amei, realmente é uma graça. Vou tentar fazer, e o bom é que dá para fazer uma variedade de coisas a partir deste ponto. Obrigada..
Amei este trabalho, e o bom é que a partir deste ponto pode-se fazer uma variedade de outras coisas. Muito grata. Super nice! What a neat idea. This also inspires me to make round placemats with using a slightly smaller cord. And nice web site too! Que fabuloso están muy especiales, debe fino él trabajo, muy agradable y fácil de hacerse felicidades. Thank you so much for this. I am not crafty at all but the instruction was soooo good and i did it!! Congratulations Jenny! this makes me so happy to hear. Thanks for taking the time to let me know. These are so fabulous, and I can’t wait to try it! I just have one question: How many yards per trivet shown? You recommend to purchase 10 yards, but does that make two trivets or just one? Thanks much! 10 yards makes one. I’m so glad you like them! Hey! Can you wash it in the machine? If it’s cotton rope, it will shrink and stiffen a bit if you wash it.